She'll be an eye-catcher wearing her Moschino Kids® Short Sleeve Logo Necklace Graphic T-Shirt. Jewel neck tee. Relaxed fit. Cap sleeves. Printed necklace design adorned brand name. High-low hemline. 95% cotton, 5% elastane. Hand wash cold, line dry. Imported. This item may ship with an attached security tag. Merchandise returned without the original security tag attached or a damaged tag may not qualify for a refund. Measurements: Length: 23 in Product measurements were taken using size 12 Big Kids. Please note that measurements may vary by size. 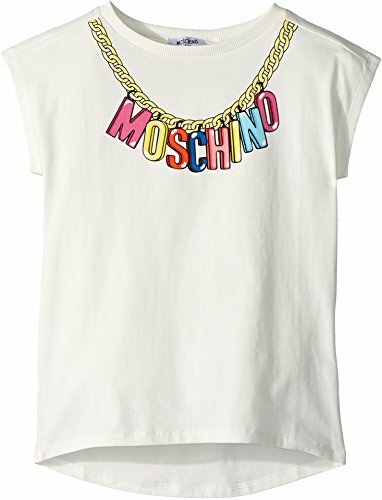 She'll be an eye-catcher wearing her Moschino Kids® Short Sleeve Logo Necklace Graphic T-Shirt. Printed necklace design adorned brand name. High-low hemline. 95% cotton, 5% elastane. Hand wash cold, line dry. Imported. This item may ship with an attached security tag. Merchandise returned without the original security tag attached or a damaged tag may not qualify for a refund. Measurements: Length: 23 in Product measurements were taken using size 12 Big Kids. Please note that measurements may vary by size.